Back to School. MGM Studios 1986. This concept is hardly new to me, but I don’t know if it was new at the time or not. 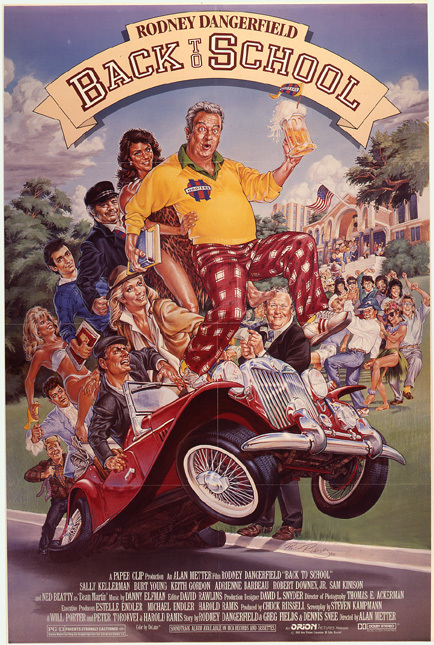 Rodney Dangerfield’s character goes back to school and embarrasses his son by being his classmate. It seems to me that the 1980s would be a time when adults were faced with re-entering education, since the changing markets would shut down factories and force people to get better degrees. Anyway, in the films I’m familiar with (Billy Madison, An Extremely Goofy Movie) have extenuating circumstances forcing the adult back into school. In the latter case, Adam Sandler has to get a high school diploma within a few months or he won’t inherit his father’s riches, and in the latter, Goofy gets laid off and doesn’t have a college degree. In this case, it appears that Dangerfield’s character is simply wealthy and has nothing better to do than go out for some higher education. That’s fine if it plays well. I don’t expect to have to hold this film to a high standard, because it’s clearly intended to be a fun popcorn movie vehicle for Dangerfield. Thornton Mellon dropped out of high school because he preferred his father’s tailoring business to college, but years later, after turning that business into a Tall and Fat clothing empire, he’s got everything he could want, except he hates his second wife and misses his son Jason at college. After getting rid of her with bad behavior and polaroid evidence of her unfaithfulness, he goes to Jason’s school to find that fraternities and the dive team don’t want him. As a manner of encouragement to get the best out of his experience, Thornton decides to enroll in school with Jason. But Thornton’s so used to throwing his money around to get what he wants, he doesn’t understand why he needs to work hard to get an education. This is exactly the reason the economics professor loathes him, though it doesn’t hurt that he’s also dating the poetry professor Thornton has his eye on. It’s always easier to complain than praise, so I’ll start with what I liked. As one would expect, Dangerfield’s dialogue is witty and speedily delivered. A lot of the jokes seemed familiar, probably either reused from his acts or quoted out of context. Robert Downey Jr.’s character, Jason’s roommate, plays the standard goofy best friend role with an energy and weirdness I haven’t seen before. That said, I have two main complaints about the story structure: first, the economics professor’s contempt for Thornton starts at very strong levels and is only fueled by his poor work ethic. So I see no reason to have him dating Thornton’s love interest. He doesn’t even get shown to be all that hurt by her spurning him. In fact, there’s not much payoff of anything relevant to the story. The climactic oral exam to prove he’s learned from his classes? He sleepily stumbles through the economics portion, gets fired up by a poem, and then that’s all we get. The narrative saves all the dramatic tension for the diving competition directly after the exam, he gets pulled in as a backup diver and effortlessly does the Triple Chekhov’s Gun dive that he said was too dangerous to keep doing when he was a young man. He didn’t even need to do that well, since the other team was casually sabotaged. Oddly for a vehicle story, the best payoffs seem to be in Jason’s arc. His major problems are getting his father to let him make his own opportunities and getting his dream girl, and both of those have strong closure. As a container for Rodney Dangerfield’s humor, it’s everything you could want. As a story, it’s a little disappointing, but I was laughing too much to care a lot. No classic, a little poorer than I expected, but still a decent experience. Watch this movie: if a standup performance has trouble holding your attention.